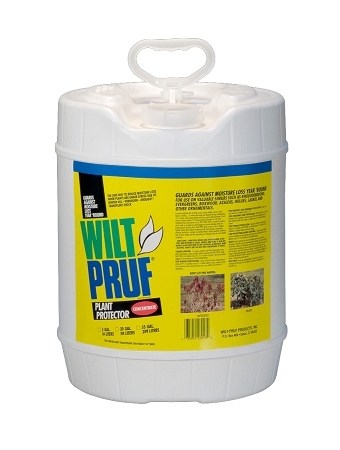 Wilt Pruf concentrate 5-Gallon, dilute before use, makes 25-50 gallons of solution. Usually ships in 24-48 hrs. via FedEx, add to Cart and enter your zip code to view shipping options/costs. Protects valuable shrubs such as evergreens, Rhododendrons, Azaleas, Hollies, Boxwood, Laurel, and many other ornamentals when under water stress - by reducing moisture loss through foliage. Protects against cold drying winds of winter and hot drying winds of summer. Protects plants when roots are frozen in the winter depriving them of their normal moisture intake as well as during periods of drought. Protects tender transplants while their root systems are developing. Tubers and bulbs do better in storage when first sprayed or dipped with Wilt-Pruf®. Protects and extends the life of Christmas trees and wreaths by reducing moisture loss which results in needle drop and browning.